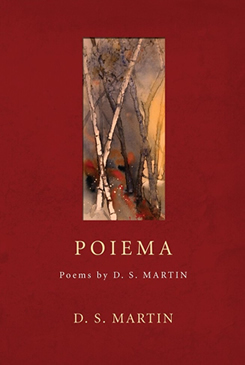 D. S. Martin’s first full book of poetry entitled, Poiema is out. Publishers Wipf & Stock quote Luci Shaw as saying “Each of these poems makes you want to descend to its heart and discover the precious metal there. D. S. Martin knows how to evoke the mystery that lies beneath the relationships we have with ourselves, each other, and God. “This is skillful and probing poetry.” Martin says, “The title Poiema is the Greek word in Ephesians 2:10 that is often translated workmanship. Another way the verse could be translated is: We are God’s poem. This says so much about us and our world, and is an insight that fits well with much of what I seek to capture in my poetry.” Martin is a Canadian whose poetry appeared in numerous literary journals and magazines such as Canadian Literature, The Christian Century, The Fiddlehead, Queen’s Quarterly and more. His chapbook, So the Moon Would Not Be Swallowed (The Word Guild’s Award of Merit 2008) was published with Rubicon Press in 2007 and is reviewed in the Imago Newsletter. He writes about poetry for Faith Today, Books and Culture and Image.